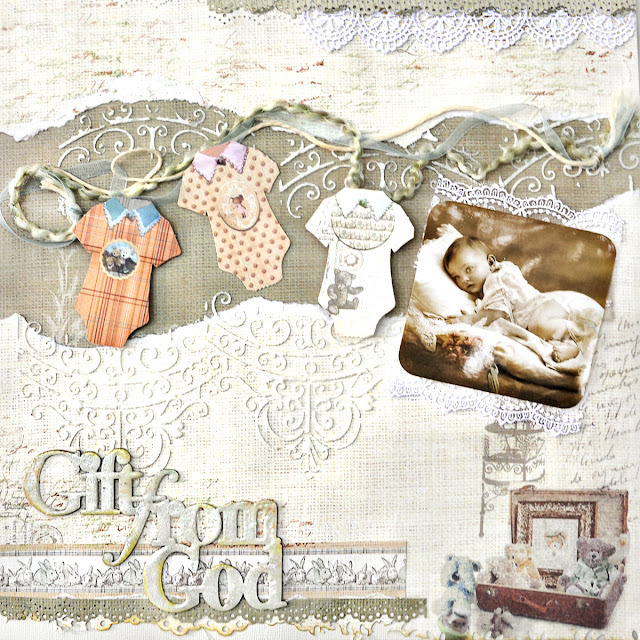 This is a layout using the wonderful new collection Baby Bear from FabScraps. 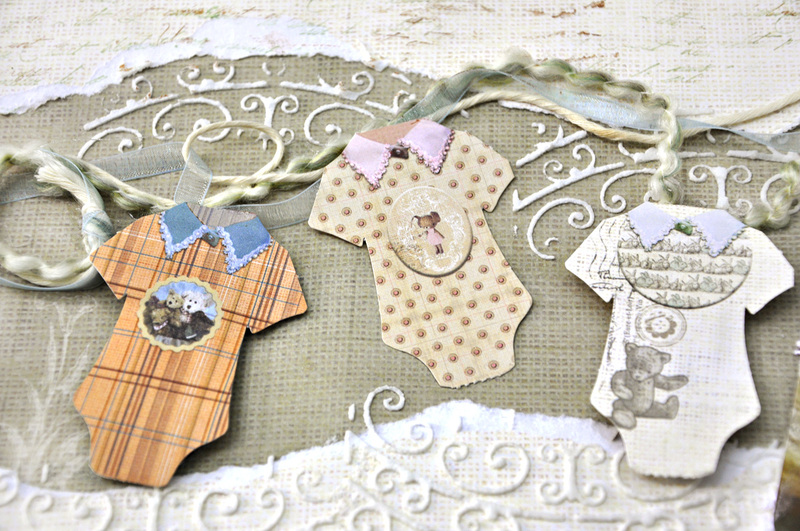 The papers remind me of vintage childhood photos with neutral tones and sweet teddy bears. So I grabbed a vintage photo from Magic Moonlight Free Images - which offers free vintage images with no copyright restrictions. I painted the image first with gesso and let it dry. Then I embossed it with Shimmerz Enamlez - Sparkaliscious and inked the edges with a warm olive ink - Donna Salazar's Mixd Media Inx in Mossy. I used an oldie but goodie Prima mask - the Gate - 550042 and followed the curves of the ripped paper. Thanks for looking. Visit the FabScraps facebook page here. Visit the blog here to see the newest collections to be released soon. 2. Start with FabScraps Baby Bear Collection –Bunny Bear 2 C57008 – punch the bottom edge - about 9 inches wide starting at the left. 3. Lightly ink the punched edge with olive green or a neutral tone, like light brown. 4. Punch two 8in strips of FabScraps Baby Bear Collection –Bubble Bear 1 C57005 making two thin punched borders. Glue one edge to the top of the Bunny Bear 2 paper starting at the right corner. Glue the second punched edge to the bottom of the Bunny Bear 2 paper starting at the bottom left corner. 5. Cut a decorative strip from FabScraps Baby Bear Collection –Journal Pre-Cuts MC57 001A. Glue the strip to the bottom of the page so that it is touching the punched edge in step 4. 6. Rip a 3 in strip of the Bunny Bear paper horizontally starting about two inches from the top. Rip all the way across. You can set aside the actual ripped section for the purposes of this project. You will not need it. 7. Reposition the two pieces onto the FabScraps Baby Bear Collection –Bubble Bear 1 C57005. Like puzzle pieces with the center section missing. You will see the green from the Bubble Bear paper showing through. 9. Using a decorative mask/stencil and white molding paste, add some stenciling to the edges of the ripped Bunny Bear paper-stencil both the top and bottom of the rips. Let dry. 11. Glue lace to the top and bottom edges of the photo as a photo mat. 12. Glue to the layout on the right hand side covering part of the ripped section. 14. 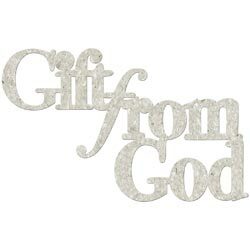 FabScraps Baby Bear –Gift From God chipboard DC57007 –coat chipboard words with white gesso and let dry. 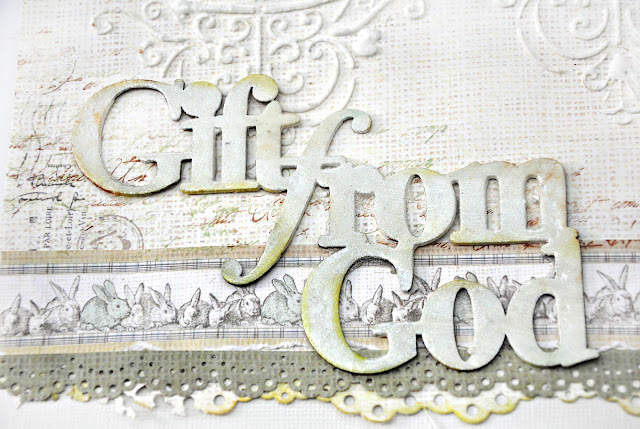 Cover with embossing ink and generously pour white embossing powder on the chipboard. Do not shake off the excess embossing powder. Leave it thick. Heat set. 15. Use olive green ink to lightly ink the edges of the words. 16. Glue the chipboard to the page at the bottom left corner. 18. Loosely place some fibers onto the ripped section from side to side. Let drape and twist and fall as it wants. Glue in place. 19. Select three diecut baby shirts from Baby Bear Collection – Journal Pre-Cuts MC57 001A. Add dimensional dots or cardboard to the back of two shirts to lift them off the page and add dimension to the page. 20. Glue on top of the fibers as if they are hanging on a laundry line to dry.